Tacoma Little Theatre continues its partnership with The Social Bar and Grill to present a murder mystery dinner experience, Death by Valentine, directed by Karen Christensen. 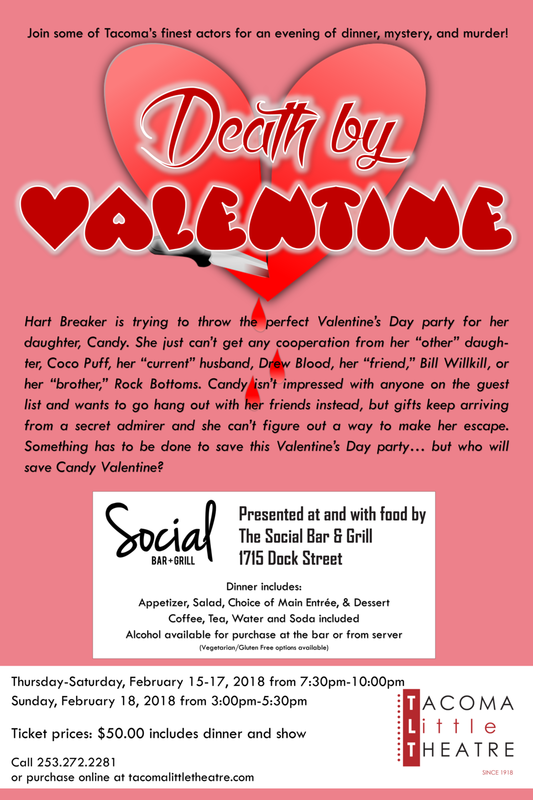 Hart Breaker is trying to throw the perfect Valentine's Day party for her daughter, Candy. She just can't get any cooperation from her "other" daughter, Coco Puff, her "current" husband, Drew Blood, her "friend," Bill Willkill, or her "brother," Rock Bottoms. Candy isn't impressed with anyone on the guest list and wants to go hang out with her friends instead, but gifts keep arriving from a secret admirer and she can't figure out a way to make her escape. Something has to be done to save this Valentine's Day party. but who will save Candy Valentine? This exciting and fun filled murder mystery dinner will star local favorites: Bob Lozier, George McClure, Sharry O’Hare, Brynne Geiszler, Heidi Walworth-Horn, and a special guest star. DEATH BY VALENTINE will run February 15-18, 2018. Thursday-Saturday performances will begin at 7:30pm, and the Sunday performance will begin at 3:00pm. The event is held at The Social Bar and Grill, 1715 Dock Street, Tacoma, WA. RESERVATIONS ARE REQUIRED. Tickets are $50.00 per person (includes dinner and show) and may be purchased online at www.tacomalittletheatre.com, or by calling our Box Office at (253) 272-2281.